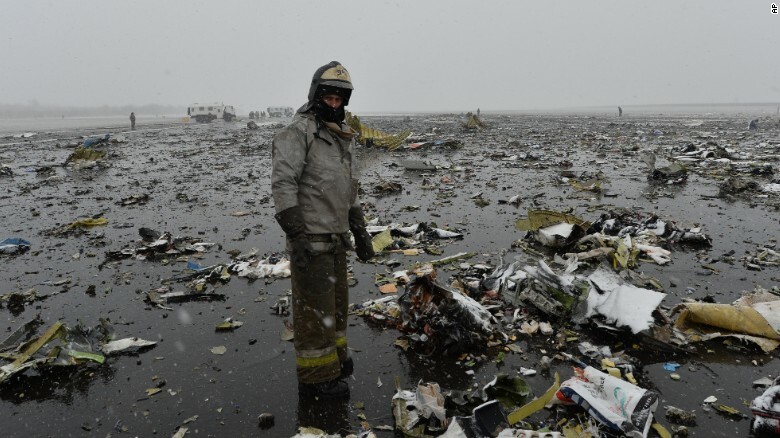 Russian's Interstate Aviation Committee (IAC) has issued five "prompt"
safety recommendations in its interim report on the crash of Flydubai flight 981, a Boeing 737-800 that plunged into the ground after a second missed approach at the Rostov-on-Don airport early on the morning of March 19, killing all 62 aboard. 737-800 operators to take note of the findings. The early recommendations hint that disorientation as a result of the dynamic maneuver-a full-power go-around with both engines operating and low aircraft weight after six hours of flying-could have played a major role in the crash. Fatigue or circadian rhythm issues could also be involved, given the aircraft was attempting the second landing at approximately 3:30 a.m.
Based on flight data recorder (FDR) and cockpit voice recorder information, an international team of investigators determined that crew abandoned the second instrument landing system approach to Runway 22 at a height of 722 ft., then climbed to steeply to approximately 3,280 ft. before entering a steep dive and crashing 400 ft. past the threshold of Runway 22. What happened during that climb will be key to solving the mystery. Data shows pilots may have initiated the second abort due to an abrupt 20 kt. increase in indicated airspeed, possibly signaling wind shear. The pilots in response set maximum power to the engines, raised the landing gear and began climbing at approximately 4,000 ft./min. Investigators said the final portion of both approaches had been flown with the autopilot and autothrottle systems turned off, but the flight director turned on. The flight director provides a visual indication on the primary flight display of how the pilot should control the aircraft to follow a pre-programmed course. At a height of 1,900 ft. with a pitch attitude of 18 degrees nose-up, the pilot-flying pushed forward on the control column, causing the flaps, which had been set at 15 degrees, to automatically retract to 10 degrees to prevent over-speed damage. After a reduction in power, the crew then restored full power and the pilot-flying pulled back on the control column resulting in a climb rate of about 3,200 ft./min. At approximately 3,000 ft. height, investigators said there was a "simultaneous" control column nose-down input and stabilizer nose-down deflection. Pilots use the control column to deflect the elevator while an electrical switch on the control column can be used to move the stabilizer to provide trim control. The FDR showed that the stabilizer nose-down trim control input lasted 12 seconds, and the CVR verified the sound of the trim system in motion. The combination of control inputs resulted in a -1G push-over that resulted in a steep dive from which the crew did not recover. Two recommendations call for airlines to provide "additional training,"
including simulator scenarios, on go-arounds with two engines operating from various heights and lower aircraft weights. The IAC also wants airlines to study the safety recommendations it issued after the November 2013 crash of a Tatarstan Airlines Boeing 737-500 at Kazan, and the May 2006 crash of an Armavia Airbus A320 near Sochi. Both crashes involved crew mistakes in part caused by higher than normal accelerations caused by two-engine go-arounds. Potential illusions include somatogravic illusions, which can lead a pilot to believe that forward acceleration is causing the aircraft is pitch up steeply. Another recommendation calls on airlines to analyze recommendations made by the French safety agency BEA in its August 2013 Aeroplane State Awareness during Go-Around (Asaga) study. BEA concluded that pilots are ill-prepared for go-arounds, relatively rare events where many actions must be completed in a short time, leaving little margin for error in handling automation and control of the aircraft. Failure to handle either can lead to a loss of control. Along with calling for somatogravic illusions to be incorporated into simulators, the BEA also recommended more training for go-arounds, particularly with both engines operating, and installation of devices to limit thrust during go-around.